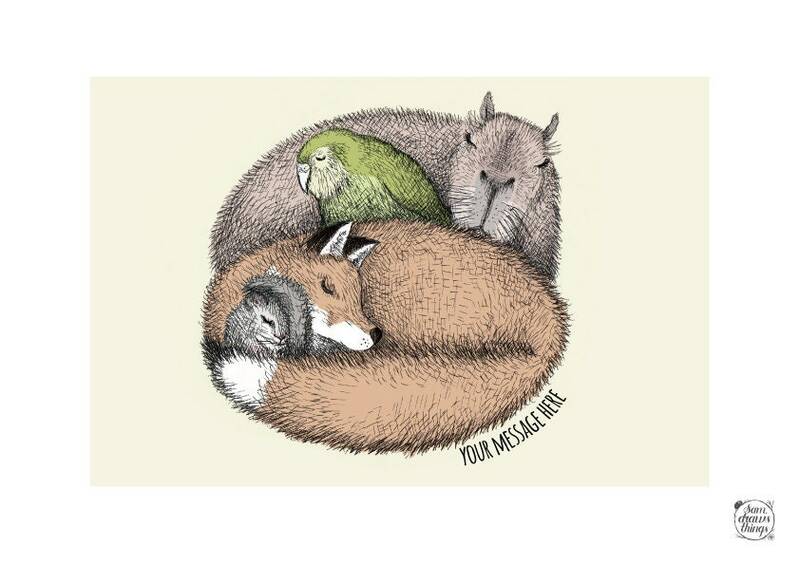 A capybara, kakapo, red fox and an edible dormouse snooze in a happy snuggle pile. This print was designed to celebrate chosen family and friend. Family doesn't always look the same, or come from the same place. You don't have to be related to love someone. This diverse bunch are sleepily enjoying that peacefully together. The animals have been carefully drawn in pen and ink, and I've added the muted colours digitally. You can customise it with your own text or message (up to 36 characters). This listing is for a signed A4 print on warm white archival paper, taken from my original illustration. It is unmounted, and comes safely backed on coloured recycled card, wrapped in biodegradable cellophane to protect it. It's pretty enough to be given as a gift as it is, or for you to find the perfect frame. There is a white border around the edge of the print and it is designed to fit a 6x9" mount.